Two weeks ago, on a cool and misty evening, I found myself tromping through Jasper Woods in search of the painted trillium. If you’ve never been to Jasper Woods, and I hadn’t, it is a 40-acre sanctuary owned by the Michigan Nature Association. Another 40-acre sanctuary, this one belonging to the Detroit Audubon Society, adjoins it on Dunlap Road just north of the Pine River in Kimball Township. My guides were Bill and Cheryl Collins, owners of Huron Ecologic, a consulting firm in Rochester Hills. Months earlier, I had mentioned to the Collinses that I’d never come across a painted trillium. They promised to show me a stand and were kind enough to keep that promise. Photographer Mark Rummel joined us. He’s a dedicated morel hunter, and I’m a regular Euell Gibbons when it comes to stalking the wild asparagus. We agree there is no finer time to be in the woods than early spring, especially those fleeting but precious days after the trillium blossoms and before the mosquitoes hatch. This expedition, alas, was ill-timed. The season’s first brood of mosquitoes had emerged, and it didn’t take them long to draw blood. Nor did it take long, fortunately, for the Collinses to lead us to a sprinkling of painted trillium. They were, I’ll admit, a bit of disappointment. In a well-cropped photograph, the painted trillium is a striking, gorgeous flower. In the field, it is rather small and less impressive than its more common cousins, the large white trillium or the red trillium. The painted trillium, or striped wake-robin as it’s also called, is quite lovely, but only if you kneel and get close enough to appreciate its splendor. While I swatted at mosquitoes, Bill Collins freed a swarm of facts to buzz among them. The painted trillium, he told me, is a member of the lily family. It loves acidic, sandy soils that are moist but not too wet. It’s often found among hemlock, pine and paper birch, or the “mesic northern forest” if you want to get fancy. It favors “tip-up mounds,” the well-decayed root balls of storm-toppled trees. Its name has Swedish roots, derived from the word “trilling,” which I gather means triplet, an apt name for a three-leaf, three-petal flower. 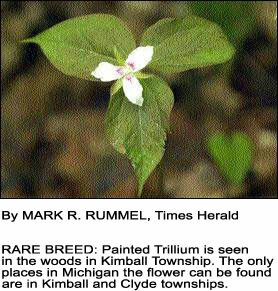 In Michigan, the painted trillium is found in Kimball and Clyde townships, and just about nowhere else. The Collinses know of a stand in Port Huron Township, but they fear it’s doomed by encroaching development. Suburbs recently overtook a patch in Fort Gratiot. A stand in Sanilac County was destroyed shortly after it was discovered. A trillium plant can survive for 40 or more years, blossoming spring after spring, but it’s a precarious existence. I first met Cheryl Collins more than 15 years ago. She was an articulate critic of the Fort Gratiot Sanitary Landfill and the poisons she feared might be leaching from it. Bill and I share this: We’re both Eagle Scouts, and we both spent green and golden summers working at Scout camps. For several years in the 1970s and ’80s, Bill taught nature courses at Silver Trails Scout Reservation on the Black River near Jeddo. He studied botany at Michigan State and after graduation took a job as a wetlands ecologist for a Troy engineering firm. In 1998, he and Cheryl started their own company. I have no idea if Bill is the world’s foremost authority on the painted trillium, but he certainly makes the short list. He is almost unquestionably the leading authority on an even more arcane topic: Charles Keene Dodge, the amateur botanist who first identified painted trillium in St. Clair County. No list of Port Huron’s notable and memorable residents would be complete without Dodge, an attorney and the deputy collector of customs in an era when the job was a political — and enviable — appointment. Born in 1844 near Jackson, he graduated from the University of Michigan in 1870. He landed in Port Huron a few years later after being admitted to the bar. All this information comes from an article Bill Collins wrote three years ago for The Lakeshore Guardian. He noted that when Dodge died in 1917, he left his collection of about 40,000 specimens to his alma mater, where they remain part of the Michigan Herbarium. In 1897, at the tender age of 53, Dodge surrendered his bachelorhood and married Millie Burns. They set up housekeeping at 2805 Gratiot Ave.
Three years later, Dodge published his masterpiece, Flora of St. Clair County, Michigan, and the Western Part of Lambton County, Ontario. He later would write a chapter on flora for the History of St. Clair County, a 1911 work by his friend and fellow barrister, William Lee Jenks. It was Dodge who first called for setting aside a forest preserve at the confluence of Mill Creek and the Black River. That sublime landscape now sits at the heart of the Port Huron State Game Area, which Bill Collins describes as a peerless jewel.